Tornado season is upon us and already there has been an outbreak of twisters across the heartland of America. Are you ready for this or some other disaster? Now is the time to either check the supplies in your 72 hour kit or pack one. 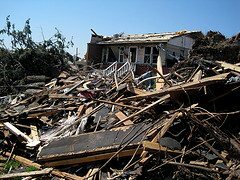 It’s estimated that it takes 3 days for relief to get into an area where a natural disaster has occurred. Your 72 hour kit could mean the difference between life and death in an emergency situation. Your kit should be tailor made to suit your family’s needs and adjusted according to the size of your family, but you should have the following essential items kept separately from your normal everyday household items. A comfort kit including soap, shampoo, razors, sanitary items, toilet paper, toothbrush and cleaner. One gallon per person per day is the minimum amount of water you should have on hand. Don’t forget extra for pets. Copies of legal papers such as birth certificates, marriage licenses, wills, and insurance forms stored in water proof zip lock bags. If you’ve created a Grab-n-Go Binder, you already have these documents in place. Your 72 hour kit should be in a portable container near an exit of your house or in the safe room of your home. Each family member should have their own 72 hour kit that they can carry. Be sure to personalize your 72 hour kit for each member of the family. Adjust clothing for winter or summer needs. Check your kit every 6 months and rotate items that are soon to expire. This is just the basic framework for your 72 hour kit. Now you need to think further. Do you have small children? Do you have pets? Do you have a special needs family member? Do you care for an elderly parent? If the answer is yes, you need to adapt your 72 hour kit for them as well. You’ll find tips for these specialized kits in Survival Mom: How to Prepare Your Family for Everyday Disasters and Worst Case Scenarios. Practice is also essential when it comes to your survival. You need to have a plan and run some drills. You should know exactly where your kit is. You should know how quickly you can get it loaded into your vehicle should you have to evacuate. The more familiar you and your family are with your gear and how to use it, the more likely you will be calm and level headed in an emergency. Skill of the Month: Homemade Tortillas! Make sure you also have one in your place of work. I had been thinking of putting one inside my classroom but hadn’t since my car is only steps away from my door. I have since changed my mind and now am stocking food & water for 36 plus a camp potty. We just had a 2 hour lockdown due to a bank robbery and of course I couldn’t get out to my car. It extended through the lunch period. There is no water in my room and no rest room facilities. I was lucky in that no one had to “go.” I offered the guys some empty water bottles if they asked but they said no, they would wait. I did have a private area. Other teachers had their students “go” in waste baskets. One teacher had a camp potty. I am following his example. I had a few snacks which helped out especially for the diabetics. The experience made me rethink everything. I love that you’re thinking this way as a teacher! My daughter’s classroom has an attatched restroom, snack cabinet and bottled water. I feel much better knowing her teacher has things covered for the times I might not be able to be with her (especially since she’s only 5)! Good write up! I was trying to find something to add, but you covered all the bases. One problem I’ve been having with my 72hr bag is finding a bag that is big enough to fit everything in, but not to big that I can’t carry it. Do you have any suggestions for what type or brand of bag I should be looking for? your pack size is limited by your body type, I would recommend going to a local hiking and camping store and getting fitted and trying some on before purchasing a bag. Also I suggest going lighter and cutting things to the bear essentials. It’s easy to carry a lot of gear if you have multiple people in your group so think about what you need and how to divide the weight. some things will have to be left behind. If you want a lot of info on bags and carrying/backpacking get a copy of The Complete Walker it’s a tomb of backpacking info. A quick fix = a five-gallon bucket with water pipe covering (the black soft stuff) around the top for cushioning works well for trying times & camping. Keep the top, lime or cat litter in bottom handy! When camping, punch the bottom out & dig a hole to cover. I’ve been mulling over the 72-hour BOB and can’t really understand why it’s necessary – because when would you actually use it? MOST towns have emergency shelters, if your house was flooded/blown away/burned up. If you had the cash, (which you obviously should), you could stay in a hotel (short term) until shelters were available. I can see maybe in a hurricane situation- if you stayed against the warnings…and then had to trek out on foot (unlikely for long with rescue forces out). I could see this in earthquake country if the hwy’s all collapsed and you could not drive anywhere. But that would be helpful only if it happened at home or your pack was at home (undamaged) or in your car (or at work- wherever YOU were). If you’re a student, you would be in class and unable to go back inside the dorm. There are lots of scenarios where you might need one at your desk AND in your car, because it wouldn’t help much if a tornado took it with the car, or the house, or earthquake (the big one) leaves you stranded at work. If you evacuate due to wildfire, you’re not going to go ‘camping’ are you? If so, then it might be better to just keep all your camping gear in the car at all times. I can’t help but think –when would you REALLY need to use one?